Taapsee Pannu and Rishi Kapoor-starrer Mulk's first posters have been released. The courtroom drama has been helmed by ace filmmaker Anubhav Sinha and is backed by Deepak Murkut. The film also features Ashutosh Rana, Manoj Pahwa, Neena Gupta, Prateik Babbar, and Rajat Kapoor in key roles. The makers of Rishi Kapoor and Taapsee Pannu starrer-Mulk have unveiled the first look posters of the much-awaited film. The courtroom drama has been helmed by ace filmmaker Anubhav Sinha and is backed by Deepak Murkut. The intense film showcases Taapsee Pannu as a lawyer. 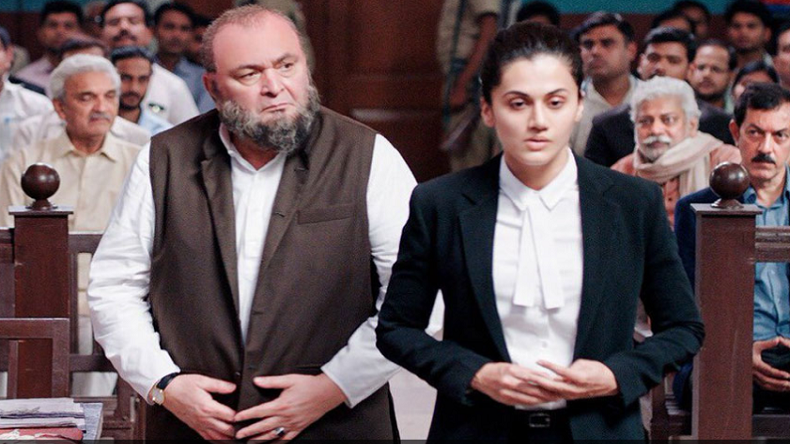 According to media reports, the film revolves around veteran actor Rishi Kapoor’s court case in which he is the accused and Taapsee will be the defence lawyer who will fight for justice for Murad Ali Mohammed which is played by veteran actor Rishi Kapoor. The last time Taapsee was seen in a courtroom drama was in 2016 film Pink which also featured legendary actor Amitabh Bachchan. The director of Mulk, Anubhav Sinha has previously directed films like Dus, Tum Bin and Shah Rukh Khan-starrer Ra One. He also penned the screenplay of Madhuri Dixit and Juhi Chawla-starrer Gulaab Gang. According to media reports, Mulk will be an intense film with a captivating narration. The film also features Ashutosh Rana, Manoj Pahwa, Neena Gupta, Prateik Babbar, and Rajat Kapoor in key roles. Mulk is slated to hit the silver screen on August 3 this year. Rishi Kapoor was last seen in comedy drama 102 Not Out along with Amitabh Bachchan. Besides Mulk, he will also be seen in Leela Yadav’s short film Rajma Chawal. Taapsee, on the other hand, will also be seen in Sandeep Singh biopic titled Soorma along with Angad Bedi and Diljit Dosanjh. Rishi Kapoor and Taapsee will be sharing the screen space for the first time in Mulk which is one of the most anticipated films of this year. The film was earlier slated for a July release but due to some post-production issues, it was postponed to August 3 this year. Rishi Kapoor’s fans are extremely excited to watch him in such an intense role.